Beautiful seminar room near the attractive city Freiburg in the Black Forest. The Yogsstudio in the Fabrik Sonntag is located near Freiburg in the Black Forest at the foot of the Kandel mountain. Originally, it was a center for consciousness and meditation which I founded many years ago. The light premises in a tastefully converted historic spinning mill are in the outskirts of town and easily reachable from Freiburg in 20 minutes via the highway or the S-Bahn. Parking is plentiful and it is well signposted and easy to find. Accommodation in nearby guest houses or hotels can be arranged if required. 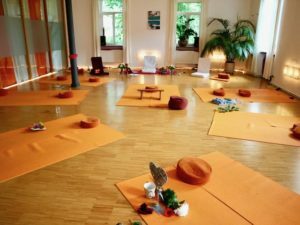 The quite surrounding of Waldkirch close to nature supports our tantric process. We are served by our Ayurvedic cook or a vegetarian catering service of the renowned park hotel “Krone”, which provides us during the seminars with 3 rich buffets for our well-being. There is a dining room in the yoga studio and a terrace with a green area for relaxing during breaks. Waldkirch is known for its picturesque surroundings, gemstone cutting and organ building. For a stay in Freiburg with its medieval old town, it is worthwhile to spend a few relaxing holidays. Enjoy the romantic atmosphere and the southern flair of this small town in the Black Forest. ob alle mit * markierten Felder ausgefüllt sind. Nachdem du das Buchungsformular abgeschickt hast, erhältst du eine automatische Antwort mit Angaben zur Überweisung der Anzahlung. Sollte das nicht der Fall sein, nimm bitte Kontakt mit uns auf! Wir benötigen für jede teilnehmende Person eine eigene Anmeldung, falls du mit deinem/r Partner/in kommst bitte das Buchungsformular für jede Person einzeln ausfüllen. Die Anmeldung zum Seminar und die Buchung des Seminarhauses ist mit Absenden des Formulars verbindlich! Wir reservieren den Seminarplatz nach Eingang der Anzahlung, weitere Informationen bitte aus der AGB/Widerrufsbelehrung entnehmen. We reserve your workshop place after receiving your deposit. For further information please see conditions of participation. Before you submit the form, please make sure that all the fields marked with an asterisk (*) are filled out. After you have submitted the booking form, you will receive an automatic response with information concerning the credit transfer of the deposit. If you don’t receive any mail, please contact us! We need a separate registration for each participant, so if you are coming with your partner, please fill out the form for each person individually. On sending the form, the registration for the workshop and the booking for the seminar house are binding!